Hungry Lucy is one of the most mellow bands in the increasingly industrial/harsh EBM-sounding Alfa Matrix roster. They make up an interesting and necessary contrast to bands like Monolith, Sonar or Plastic Noise Experience with their very own brand of brooding pop. Vocalist Christa Belle's angelic voice hovers over Delerium-like outbursts of trip hop and straight-up pop. Like both of their previous albums, "Apparitions: Revisited" and "Glo", "To Kill a King" is pretty solid all the way through without any real fiascos. Highlights are much easier to find. Take "You Are", for instance, a track that sums up the album beautifully. Medieval influences spice up a melodic mid tempo pop track and Christa's heavenly vocals further enhances this mesmerising tune. 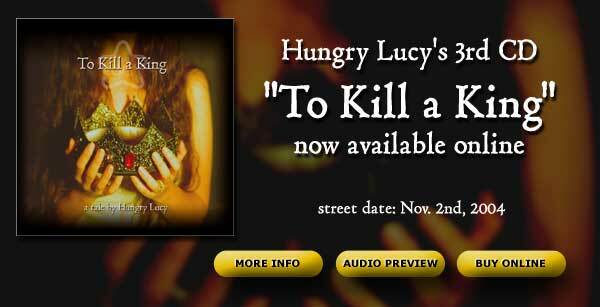 The trademark Hungry Lucy sound is still intact, albeit at the expense of evolving as a band.